Learn 3 reasons why BIG Presentations need a different approach to regular presentations. Why your current slide design skills may not be enough for high-stakes presentations and the 2 ways in which you can do something about it. Most presenters design their PowerPoint slides for their critical business presentations – the same way as they design slides for their regular internal presentations. Unfortunately, what they don’t realize is – the approach that works for small internal presentations hardly ever works for BIG external presentations. When you understand the key differences between small and BIG presentations – you will approach designing your PowerPoint slides for your BIG presentations in a more strategic way. So, let us start exploring a few major differences. But before that, let me clearly define what I consider to be mission critical presentations. According to me, a BIG presentation is the one where the stakes are so insanely high that you can’t afford to mess it up. In such presentations, you want your audience, not just to show up – but to hang on to every word you have to say, get excited by the potential of possibilities, feel eager to take action and go rave about the message you have just delivered to every one they find in sight. That is why, it is crucial to make your PowerPoint slides shine in such presentations. #1: There is no judgment involved in an internal presentation. The audience knows you well. They already trust you. So, they focus their attention on “what you have to say”, rather than judging you on “how you say it”. Whereas in a BIG presentation trust is not yet formed between you and the audience. So, everything you say, do or show is used to evaluate the level of trustworthiness of you and your brand. #2: In an internal presentation you always have a second chance to rectify a mistake. If you goof up a presentation, you can always call the members again and present your ideas again with more clarity. Whereas, in a BIG presentation you don’t have a second chance. It takes months to get all the key decision makers in one place – for a big B2B sales presentation. It takes a lot of money, effort and time to organize an event or a roadshow. You can’t just call your audience back to present a better version of your presentation. It is easier because they are so few in numbers. You can easily keep a tab on them. Even if someone drifts off, you can quickly pull them back in. Whereas, in a BIG presentation – your audience is either large or comprises of senior managers. In either case, it is not easy to hold their attention, unless what you say is highly relevant and engaging. So, approaching a BIG presentation is very different from approaching a small, internal presentation. You simply can’t compromise with either the design or the visuality of your slides. With that said, how do you design clear and memorable visual slides for your mission critical presentations? You either outsource the slide deck production to an external agency or you build your slides on your own. Let’s explore the first option – which is to outsource your slide creation to an external agency. To shape the message inside your own head into a meaningful idea is a challenge in itself. Now, for an external agency that has no clue or background about your business or ideas to extract those ideas from your head – and create well-designed visual slides – is too much to expect realistically. Even if you muster enough courage to go that route, you need to realize that it is a highly iterative process with endless trial and error. If your BIG presentation depends on the agency to deliver your slides in time – you are bound to go into depression with anxiety and stress. If you have ever outsourced your presentations – you know this already. In fact, I have experienced the frustration myself a number of times. When as a senior manager, I tried to outsource slide creation to external agencies – I could never get the slides delivered on time. The tension used to give me ulcers each time. Those bitter experiences with outsourcing presentations – drove me into creating my presentation slides myself. That is when I realized that it was not as easy to create high quality slides as I imagined. It took me many years of dedicated experimentation to create slides that I felt confident enough to present in a boardroom for BIG events. But, the level of confidence my slides gave me in BIG presentations and the career growth I enjoyed because of my skills in creating winning business presentations was significant. … Create your slides on your own. But, be warned that it is not easy to design top quality slides for your mission critical presentations just by going through trial and error method. If your presentations need to look ‘up to snuff’- it takes hours to think of the right visuals to convey your message. Once you think of the right visuals, you need to spend even more time to create the graphics the right way, align them, distribute them, apply the right effects and apply the right animation and so on. If you are a business professional – it is a criminal waste of time to fiddle with PowerPoint – while you could be doing a hundred other revenue generating activities to grow your business. You can start going through our free articles and videos from our other site – Presentation-Process.com. There is a lot of content in the site aimed for business presenters like you. 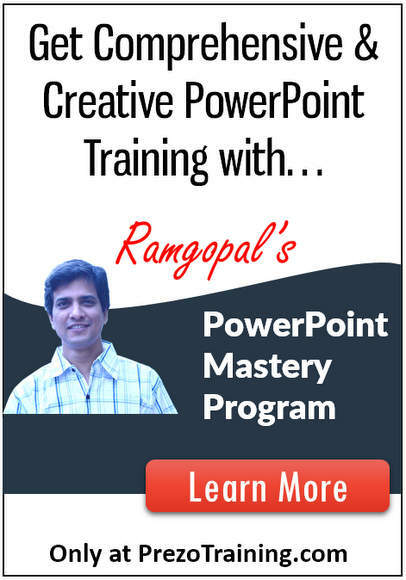 If you choose to get a proper training for your PowerPoint skills, I highly recommend you take a look at our Ramgopal’s PowerPoint Mastery Program. It is the most comprehensive and creative PowerPoint training online for business presenters. You can click on the link here to check out the program. Please check out our All-in-one-PowerPoint Templates Bundle from Presentation-Process.com. The bundle has more than 2900 studio quality templates including data driven and advanced custom animated templates to suit every business situation imaginable. You can pick the template that meets your need, replace the sample text with your own text and your slides would get ready in no time. It is a smart way to build remarkable presentations. You can click on the link here to know more about our All-in-one PowerPoint Templates Bundle. You can even use admin assistants and junior staff in your company to build your key presentations using our templates. Since most presentations involve last minute changes, you can easily customize your slides in minutes. So, whether you choose to use templates or to train yourself to build professional quality slides, make your PowerPoint slides count in a key presentation. After all, one good presentation can change the course of your career and business.